A New York Times "Notable Book of the Year"
"Victor Davis Hanson is that near-oxymoron, a celebrity classicist. A scholar of great originality and insight, he has also cast himself as the modern Machiavelli, offering advice to his country's leaders that is drawn unabashedly from the ancient past. Prior to September 11, Hanson had been tireless in launching charges against the serried ranks of his fellow classicists, skewering them for their failure ‘to explain the importance of Greek thought and values in an age of electronic information, mass entertainment and crass materialism.’ Post-September 11, he emerged as one of the most readable columnists in the US media, robustly—indeed militantly—in favour of the war in Iraq. So effectively did his talk of Greek civic virtues contribute to the political weather that he was even summoned to the White House to sup with President Bush. Having insisted to his colleagues in classics departments that the ancient world could be made relevant to those far beyond the universities, even his enemies—of which there are legion—can hardly deny that Hanson has triumphantly proven his case. All of which will make his new book, A WAR LIKE NO OTHER, of great interest to those concerned with modern America as well as with ancient Greece. Its subject is the Peloponnesian War, the savage three decade-long struggle between Athens and Sparta that ended with the ruin of Athenian imperial greatness, and which did indeed appear, to those who lived through it, a calamity without parallel. 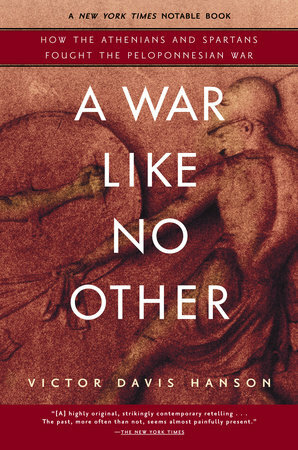 Yet there is simultaneously a knowing irony about the title, for in warfare, as in so much else, the Greeks set the pattern for the West's future—a notion that Hanson has explored with considerable brilliance throughout his work. As he points out, it was the stated goal of Thucydides, the great historian of the conflict, to make his theme ‘serve as a lesson for what can happen to any people in any war in any age.’ So it was, during the last century, that Thucydides' narrative of universal war, of newspeak and class hatred, of terrorism, revolution and genocide, appeared all too bleakly contemporary. So it is too, in a new century, and amid the raging of a new war, that Thucydides still haunts the corridors of power in America.